I am currently doing a New Media and Digital Culture masters degree at the University of Amsterdam. My interest in new media has been present for a while, having completed a bachelors degree in Communication and Multimedia Design at the Amsterdam University of Applied Sciences. During my bachelors degree I did an internship at a Dutch advertising/communications agency, working on a transmedia storytelling campaign for SOA/AIDS Nederland. Before obtaining my degree I wrote my thesis on power structures within the online network. I have spent a year in Florence, Italy studying art and have been working as a graphic designer since 2009, both freelance and for Dutch e-commerce business Greetz. After taking some time off from studying I have worked full time for a while and have then gone travelling for three months. I am now back at the University of Amsterdam to finish my masters degree, which is currently my main focus. The predicted outcome of the upcoming 2012 U.S. presidential elections is still very much subject to fluctuation. Polls are still changing on a daily basis, with the difference between predicted votes for Barack Obama and Mitt Romney only a few percent. Who will be elected on November 6th is still unclear. As we have seen with Obama during the previous election in 2008, the sentiment towards the electoral candidate’s personality has proven a big influence. Obama was very much perceived and has maintained his image as a modern family man. He is the first U.S. president since President Carter to live in the White House with young children. Romney is also perceived very much the family man, having five sons with his wife Ann. Both Ann and Michelle play key roles in their husbands’ campaigns, strengthening the image of a family man and therefore the father figure, not only at home but also for the country. As both women play such a key role in this highly undecided election race, it will be interesting to take a closer look at their public image. How prominent are both women in their husbands’ campaign? More specifically: who get’s mentioned more online and for what reason is either Michelle Obama or Ann Romney more popular? Kirsten Foot and Steven Schneider propose the concept of ‘carnival behaviour’ as a means to denote the established political norms and hierarchies by questioning these through humour and insults capable of causing offline effects through online action. In their 2002 article, they argue that this kind of online behaviour, in which political actors are parodied and become the subject of insults, can attract the interest of voters who would otherwise not be as involved in the elections ((Foot, K. A. and Schneider, S. M. (2002). “Online Action in Campaign 2000: An Exploratory Analysis of the U.S. Political Web Sphere.” Journal of Broadcasting _& Electronic Media, 46)). It can also have the power to influence political opinions. The audience is highly critical of the political actor, which is most visible through social media where every statement and act is immediately fact-checked, scrutinized or applauded. Considering the influence of online judgement towards the political actors, the current sentiment towards both Michelle Obama and Ann Romney will be measured. This will be done through content analysis of two platforms. Firstly, considering the ranking of both the Obamas and the Romneys as a team, instead of just the candidates, the association of both women regarding their surname will be measured. This will give us an insight into how top of mind both women are compared to their husbands. The tool used to measure this is Google Images, which gives us an immediately visible result regarding their ‘rank’. Secondly, an analysis of associations with each of the women will be done through analyzing Twitter Tweets. The platform Twitter is chosen for being the most openly accessible Social Media platform with the highest content production. What are the main reasons for mentioning either Michelle or Ann and in what way are they mentioned? This content analysis will result in an image of both women, comparing the presence within the search results and thus the association with their husbands and also generating an image of popularity compared to each other. This will give us an interesting insight into the current mindset towards both women and the role they play. To measure the association with both women’s last name, Google Image results will be used as a research tool, through which both search queries will enable us to classify both Michelle Obama and Ann Romney as a way of comparative ranking ((This analysis has been based solely on the first 500 results from Google Images. To prevent cookies and user history to influence search results a new web browser, Opera, has been installed.)). When entering the query “Obama”, over 6.490 million Google Image results are generated ((It should be noted that Google search results on such a hot topic fluctuate per search. These results are therefore only a representative for around 16.55 CEST on October 5th, 2012, as search results for a Dutch IP address. The results will however generate insights in the mindset toward both Michelle Obama and Ann Romney at that time.)). To narrow it down to a manageable amount to analyze, the first 500 results were considered. These results are displayed in graph 1. Of the first 500 images, only 23 images contained Michelle Obama, ranking her as the 23rd result. Of those 23 images, only 7 contained both Michelle and Barack Obama, the first image containing both of them ranked as the 254th result. The vast majority contained Barack Obama. When searched for the term “Romney”, there are over 5.260 million Google Image results. This is noticeably lower than “Obama”, however the name “Obama” has been in the public eye several years longer which would make this understandable. As visible in graph 2, of the first 500 results, 30 images contained Ann Romney, with the first image ranked at the 5th position. Not only that, almost half of the results containing Ann Romney also contained Mitt Romney. 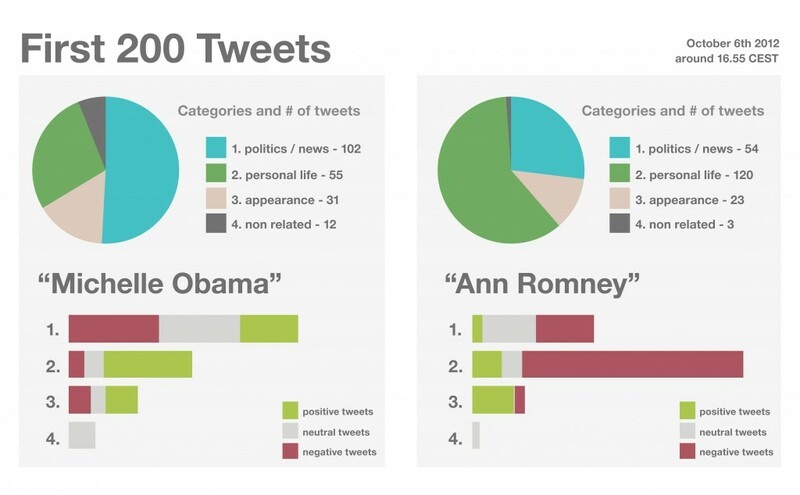 These are tweets in relation to news items or political events regarding either Michelle Obama or Ann Romney. These are tweets in relation to both women’s personal life, and non-political actions, such as their family and their personality. These tweets contain content regarding both women’s physical appearance and/or fashion choices. These tweets are either considered to be spam or do not contain enough information to categorize. Judging these tweets, we can draw a few conclusions. Firstly, Michelle Obama is much more discussed based on politics or news items, whereas these twitter users seem to prefer to discuss Ann Romney’s personal life rather than her political influence. However, Ann Romney’s personal life (family, personality) is discussed in a much more negative way than Michelle Obama’s. Ann Romney is mentioned more positively for her appearance than Michelle Obama. In total however, Michelle Obama is mentioned in a positive way 80 times, as opposed to Ann Romney, who is mentioned positively a mere 35 times. She is mentioned negatively 128 times, as opposed to Michelle Obama being mentioned negatively 57 times. These analyses can give us insight into the opinion towards both women. Based on these tweets, Ann Romney would be seen as having better sense of style or being more attractive. Michelle Obama’s political role would be a larger part of her public image and her personal life regarded more positively than Ann Romney’s. Keeping these results in mind and comparing them to the Google Images analysis, Michelle Obama could be considered to be seen as more of a political individual as opposed to Ann Romney who could be considered to be more the “wife of” than famous in her own right. This could also mean that the Romneys are considered to be more of a team than the Obamas. Ann Romney could therefore be regarded to play a more traditional role as First Lady, with the main focus being a wife and mother to her family and therefore the country. Michelle Obama could be considered more modern and independent, not only supporting her husband as a wife but also partaking in his political agenda. The question that remains is: how great is the impact of the First Lady on the outcome of the presidential elections? It will be interesting to compare the results to the eventual outcome. This research shows a more positive stance toward Michelle Obama, however the influence of the candidate’s wife on the electoral campaign remains questionable. Or perhaps Republicans just don’t tweet as much.